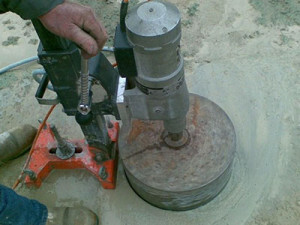 Our approach to concrete coring is simple. We know that you’re not hiring a contractor to simply drill a hole in concrete. You have a larger mission in mind. Whether it’s to make room for a plumbing or electrical service or a more specialized need, your coring project will require coordination between us and a number of other service providers. Rock Hammer Demolition will work in close coordination with your team to make sure the coring process works for your specific challenge. It’s our guarantee. Our expertise and resources make Rock Hammer Demolition uniquely qualified to manage your coring project. We can drill from narrow to wide and shallow to deep – even through steel-reinforced concrete… no easy feat. With more than 35 years of experience, our teams will approach your project with professionalism, courtesy and a team spirit necessary to execute the most complicated project with efficiency and effectiveness. With qualified technicians available day and night throughout Southern California, Rock Hammer Demolition can respond to any emergency concrete coring need. We know that your concrete coring project might not be able to wait for tomorrow. That’s why we’re ready now. We are the go-to concrete coring team for Orange County, Riverside County, San Bernardino County and Los Angeles County California. All day, every day. RockHammer Demolition Services is available ’round the clock. Over 35 years combined experience. Our technicians solve problems from demolition logistics, traffic control, to sound and dust control. Please feel free to contact us for more information about our services. We look forward to talking to you about your project.